Creative Veteran Productions is a Service Disabled Veteran Owned Small Business that specializes in Designing, Developing, and Delivering Immersive Virtual Training Experiences. We help our customers develop immersive training solutions that don't re-invent the wheel by using our LEGO approach to creating a perfect-fit training program using our platform. Our customers receive the benefit of custom solutions without the custom price tag. Our robust, cutting-edge virtual learning platform allows us to democratize 3D Serious Gaming by streamlining development efficiencies without decreasing performance quality, which provides more cost-effective immersive training solutions for our customers. We believe the instruction should dictate the modality. Whether your instruction requires a Web based, Mobile, PC, VR, AR, or Console training game, we can help you build it. 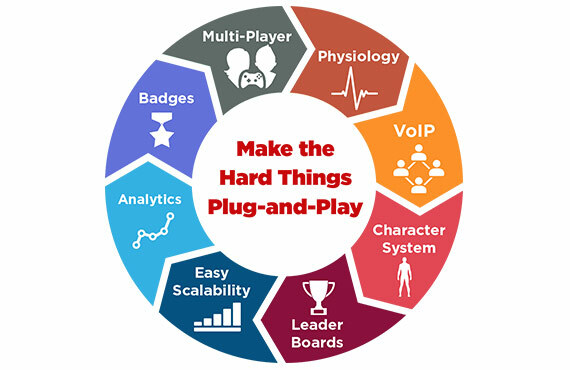 We specialize in developing efficient games that perform on average machines as well as on low-bandwidth restrictive networks using our intelligent connection fallback algorithm. We start by developing engaging content, design beautiful but efficient art, and deliver a training experience that can run on your target audience's hardware. Our platform solutions can track user performance, perform analytics, and establish a positive ROI. Discover strengths and opportunities, constantly fine-tuning your product. To drive training retention and accelerate learning, we immerse the learner in an environment as close to the target as possible, and we use gameplay to keep the user engaged. Our Gaming Management Platform makes the most common components in training games re-usable, allowing you to focus on what's important - the instruction. We call this concept Democratized 3D. Immersive solutions designed, developed, and delivered efficiently, and accessible to everyone. GSA Schedules are fast, easy, and effective contracting vehicles for both customers and vendors. For GSA Schedules, GSA establishes long-term government-wide contracts with commercial companies to provide access to millions of commercial products and services at volume discount pricing. Creative Veteran Productions is an experienced and certified small business and GSA Award Schedule Holder.